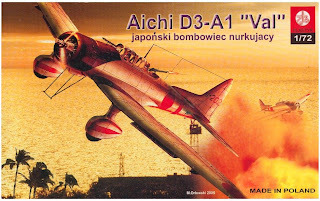 There have not been many 1/72nd scale kits of Aichi's D3A, which is perhaps surprising given its effectiveness as a maritime dive bomber in the early years of the Pacific War and its charismatic appearance. The veteran Airfix 'Val' first appeared in 1964 and was typical of the Airfix kits of that era: simple, unpretentious and honest. Markings for a single Akagi dive bomber "A1-201" were included but the tail code was depicted in black, as was the paint-it-yourself trim on the wheel spats. The distinctive sweepback of the blue-black anti-glare was not observed, the artwork and instructions depicting only a black engine cowling. It was re-issued several times with the same markings, but most recently in 1997 with improved markings options. These provided an additional option for Egusa's colourful green camouflaged and red-tailed "B1-231" from the Indian Ocean operation (although captioned as being from the Pearl Harbor attack on the instruction sheet) and now offered the black wheel trim for "A1-201" as decals. There are some concessions to accuracy, most noticeably in the 'sit' of the spatted undercarriage, and simplified details, but it has a lot of charisma, looks the part and can form the basis for an excellent model. Canadian modeller John Wong has shown just what can be achieved with the Airfix kit. It is still a favourite of mine and I like its straightforward build and robust, pugnacious look. A more detailed look at this kit and its box art will follow in due course. In 1985 Fujimi issued a new D3A "family" consisting of D3A1 and D3A2 kits sharing common parts. This required some compromise in construction and a five part fuselage including a separate upper fuselage deck. Most criticism of this kit has focused on the construction problems caused by this parts breakdown but it is undoubtedly a finer and more accurate kit than the Airfix one. Molded in Fujimi's hard glossy plastic it provided markings options for two aircraft: "Yo-206" a pre-war red-tailed, silver aircraft and "A1-203" a Pearl Harbor attacker from Akagi. The pre-war silver aircraft are sometimes modelled as being highly polished natural metal, but apart from the prototype, photographs strongly suggest they were in fact painted aluminium. Polish manufacturer Plastyk issued a D3A1 kit in 2005. It appears to be a copy of the Fujimi kit but is molded in a rather rubbery dark grey plastic with spark-eroded detail. The fit problems of the Fujimi kit have also been copied and are exacerbated by shrinkage with the upper fuselage decking being particularly problematic. The join and difference in cross section are hard to conceal without building up the lower fuselage sides. A single set of poor quality decals for the Fujimi kit's Akagi stablemate "A1-202" are included. Recommendations. For a serious model choose the Fujimi kit, but for an enjoyable weekend build the Airfix kit will not disappoint. The curious might seek out the Plastyk clone to complete a kit collection or, if feeling brave, have a go at building it. Image credits: Airfix (Hornby Hobbies Ltd.), 1964; Fujimi Mokei Co. Ltd., 1985; Plastyk, 2005. Oooo my God!!! This is direct hit into my heart Nick... I was seating today, listen music and think about the bulk of kit, still not assembled, which are still in my hometown and I was planing how to get it there [simply problem with time and organization as well bulk of work...]. Fujimi is nice kit, nice surface but maybe they could do some more about the separation of the wheel spats and the same wheels. I would not comment about the paint scheme as well last years many new data was published and for sure I will paint it in regard to this data. This kit I get in autumn 1989, when my friend come back from USA. He buy it in the DJ Hobby, San Hose, California. I am wonedr does this hobby store excist any more? Anyway I get a bulk of the haswgawa kit from there and the only Fujimi kit was this one. Can you add any comments about the interior detail on the Fujimi Val? From the Fujimi kits I have stashed away, interior detail is a decidely mixed bag ranging from poor (Gekko) to decent (Pete). I really can't recall pawing through a Val kit before. Thanks for your efforts and a great blog. The interior of the Fujimi kit is basic consisting of a floor, two seats, correctly shaped but plain instrument panel and a control column. There is a decal for the instrument panel. The structure between the pilot and observer positions is molded integrally with the upper fuselage decking as two back to head bulkheads with some equipment detail molded in relief on top. There is no sidewall detail. There is also a machine gun and plain bar mount, marked as "not for use" in the D3A1 kit.